Now that was a qualifying session! When you wake the household with a whoop of exultation as Mark Webber grabs pole and then another when Heikki Kovalainen steals it back again, you know that you've seen a nail biter. My wife is a Kovalainen fan, so her shout was the loudest, but I admit that I yelled too. Heikki has been quick all weekend so far and pole was no more than he deserved; Hamilton could perhaps have gone quicker but never seemed at his best today, struggling at the edge of adhesion and uncharacteristically ragged as a result. Webber was the big surprise, always near the front in each qualifying session, but never giving a hint that he would be on the front row after a brilliant last lap. If he and Kovalainen can hold on to their positions through the first few corners of the GP, we are in for a great race. The Ferraris were nowhere near as competitive as everyone expected them to be and Raikkonen's third spot was about as good as they could manage. Problems with Massa's car left him in 9th but it all adds to the potential for a lot of overtaking tomorrow, especially as Kubica too had to settle for 10th after his car let him down in Q3. Heidfeld seems to be overcoming his qualifying problem and is well placed to mix it with the leaders from 5th on the grid. 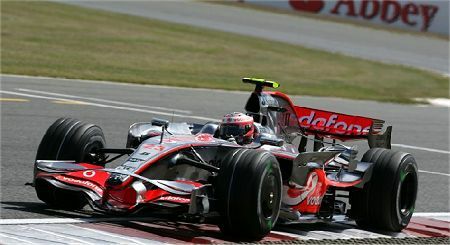 Vettel continued his excellent form at Silverstone, making it through to Q3 and slotting in just behind the Renault duo. It all amounts to a very interesting assortment in the top ten, a welcome change from the usual run of things. Below that, normality rules, Coulthard just missing the cut, the Toyotas disappointing and the Hondas and Force Indias bringing up the rear. Rosberg was unlucky to be out early, mechanical problems preventing him from having a last go at making Q2. The big question for tomorrow remains the weather. If it rains, as looks likely, anything could happen, including a list of retirements through accidents. If not, Kovalainen looks good for a win, Hamilton should be able to improve upon his grid position and Raikkonen must be a threat in the Ferrari. Either way, we should have quite a race on our hands, a fitting tribute to Silverstone on perhaps its second last outing as British GP venue. That seems unthinkable now and I can only hope that good sense will triumph in the end and this historic circuit continue to at least share the GP. Kovalainen and Webber are likely carrying half the fuel load of the No. 1 Ferrari, so the race will probably be between Kimi and Lewis, particularly if it rains. As for Silverstone, it's a boring, flat circuit and its retirement has been long overdue. Donington will make a better British GP home; a pity it couldn't be Brands, though. I agree - what a quali ! Yay for Kovi taking pole, even if it was at the expense of Webber. But it really was a mixed bag of surprises, and one can only wonder what the race will bring. I wish it were 10pm already - the suspense is killing me. You'll have watched it now, Peril, and you were absolutely right - a brilliant race!